Add some excitement to your store with a Maryellen™ Doll Drawing! She is an enthusiastic, imaginative girl growing up in the 1950s. She longs to stand out but often feels lost in the shuffle of her big, busy family. 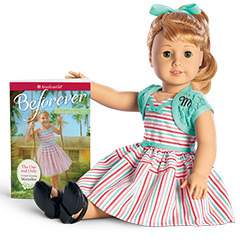 This easy-to-execute promotion enables you to buy and display a Maryellen doll in your store, and offer your customers a chance to win her through an in-store drawing. Available with qualifying order, while supplies last. We reserve the right to limit quantities.